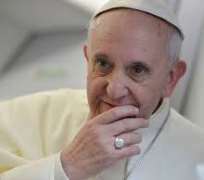 Pope Francis has decried an attack on a church in Nigeria that killed 15 people, including two priests. In remarks Sunday to the public in St. Peter’s Square, the pontiff prayed that Nigeria’s Christian community can find harmony and peace. The massacre last week occurred in Benue state in central Nigeria, which has recently seen a series of attacks, many linked to an ongoing dispute between farmers and herdsmen. Nigerian President Muhammadu Buhari has described the attacks on churches as an attempt to stoke religious conflict.